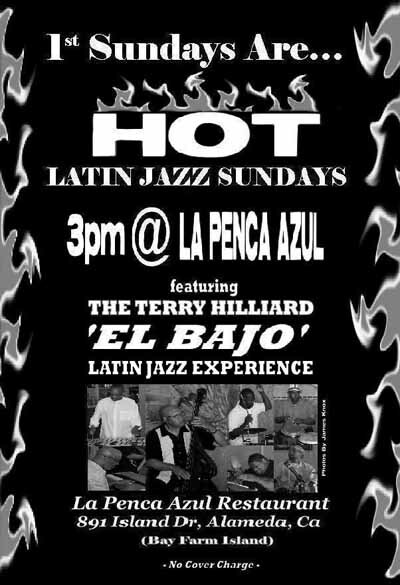 The Terry Hilliard ‘El Bajo’ Latin Jazz Experience, led by West Coast Jazz & Latin Jazz Legend John ‘Terry’ Hilliard on Bass will perform every first Sunday, starting August 7 at 3pm at La Penca Azul located at 891 Island Drive in Alameda. Made famous by his amazing performances on Cal Tjader’s ‘Soul Sauce’ & ‘Soul Bird’ Albums, Terry Hilliard is a name synonymous with Hot West Coast Latin Jazz. Terry’s All-Stars include Bay Area Jazz Notables George ‘Jazzbeau’ Spencer on Piano, Yancy ‘The Jazz Doctor’ Taylor on Vibes, and Ted Strong (a protégé of the Iconic Armando Peraza) on Congas. Rounding out the 7-piece Latin Experience is George Spencer’s Eldest Son – Michael on Drums, Terry Hilliard’s Eldest Son – Jeffrey on Bongos & Congas, and Cuban Percussion Phenom ‘Carlitos’ on Timbales. The group performs a Hot & Powerful mixture of Latin Jazz Hits from Cal Tjader, Tito Puente, and Dizzy Gillespie, that will make you shout, jump, dance, and cheer for MORE! This entry was posted on Saturday, July 30th, 2011 at 6:55 pm. It is filed under Jazz Clubs & Events, Music News/Info. You can follow any responses to this entry through the RSS 2.0 feed.